Today’s Photo 101 challenge….Architecture! Monochrome photos work lovely with all types of structures (skyscrapers, churches, bridges, etc.). This weekend, I had a chance to visit a bridge (that’s quickly being transformed into a “love lock bridge”) that is close to home. The walking bridge has a fantastic design and I was able to capture a variety of photos. Two of the photos are featured in my posts from yesterday. Here is another shot that is wide angled and features more details. I like the faint red on the biker! Nice shot! 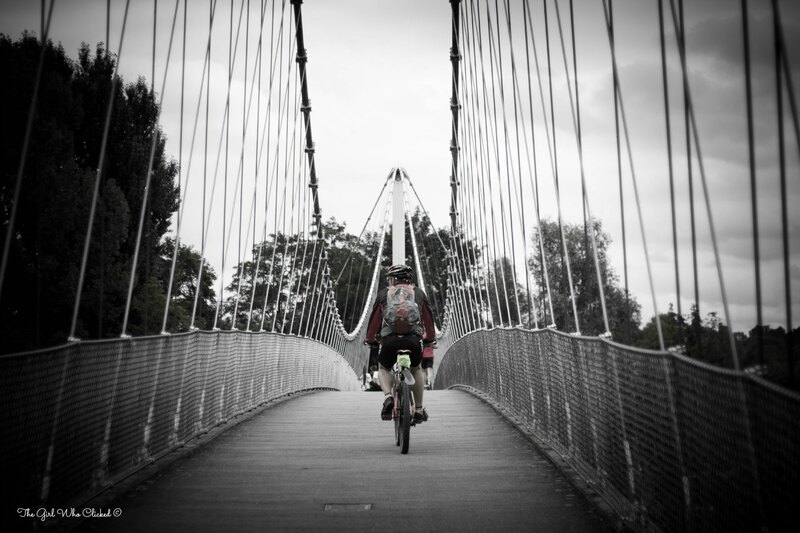 Love this – the wide angle really draws us into the shot and that bridge looks awesome! Thank you very much Barb! I really like the perspective on this shot. Is this Nuremberg? Hi there! Thank you so much. The bridge is located south of Nuremberg near the Neckar River. I thought so. I live in Nuremberg and thought I recognized it.